When I initially started thinking about doing a giveaway, the first person I thought to include was Jeanne van Etten of Nantucket Mermaid. I met Jeanne a couple of years ago at a networking event for Petticoat Row, our local women’s business association. I was new to Nantucket and just thinking of starting Papoose when I decided to brave a networking event where I knew no one. Jeanne’s was the first friendly face I saw, and she was the kindest, most optimistic and supportive person I talked to all night. She made me feel like I wasn’t just a young mom with a crazy idea for a business, like I could actually accomplish what I wanted to do. Later, when I saw her work for the first time and heard her story about how she came to be a small business owner, I was even more amazed by what a special person she is. Now, I love popping into Jeanne’s shop at 4 Fair Street for a chat and to look at her latest creations. The shop is super cute and full of all kinds of hand-painted goodness. 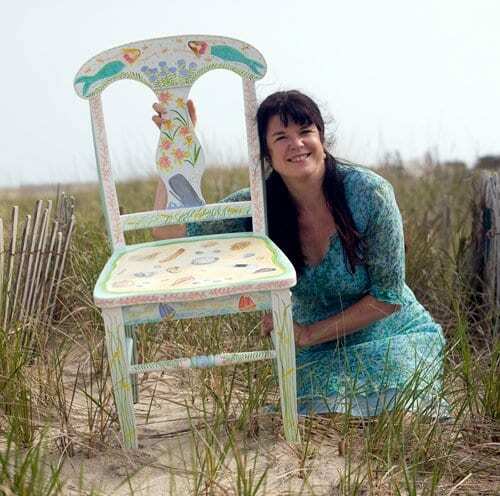 From painted shells and rocks to mugs, ornaments, picture frames, clothing and furniture, Jeanne paints everything full of Nantucket charm. And it doesn’t hurt that Jeanne is such a sweet person — still one of my favorite people to have met since moving here. It’s no wonder she came to mind as one of my favorite Nantucket business owners, perfect to start out giveaway week with one of her adorable creations: a hand painted ceramic box. The box is 6 inches in diameter x 2.5 inches tall, has an adorable painting of a lightship basket on the top and a surprise heart inside. I’m in love with it and may have to go back to her shop for another one for myself! Leave a comment on this post telling me what image/icon first comes to mind when you think of Nantucket. Is it a lighthouse, a whale, a lightship basket, a ship, a mermaid…or something else? Visit the Nantucket Mermaid Etsy Shop, then come back here and leave a comment telling me which of the items she currently has listed that you like best. Share this blog post on Facebook via the share button below, then leave a comment saying you did so. You can enter the giveaway one or all four ways. Please leave a separate comment for each “entry” so they can be counted. The giveaway will be open for one week, until midnight eastern time December 17, 2012. One winner will be selected using the random number generator at random.org and the winner will be contacted via email later that week for shipping information. Sorry, but this giveaway is open to U.S. residents only. If you don’t win (or even if you do! ), you can find more of Jeanne’s work at her shop in town at 4 Fair Street, in her Etsy shop online, or on her blog. Jeanne’s shop is open every day, 10am-5 pm Monday-Saturday and 10am-2pm on Sunday. She takes credit card orders over the phone for non-Nantucketers, she ships internationally, makes custom orders, and she is a wonderful person to talk to! 3. My favorite item is the Whale frame! The lightship basket is my Nantucket icon; I am so lucky that my mother gave me hers. I love the ceramic ship box in Jeanne’s Etsy shop. I like the Mermaid Doll Ornaments. I don’t live in Nantucket anymore, but my Christmas tree is decked out Nantucket style. I also shared on Facebook. I would love to win that sweet ceramic box! I love giveaways and I love Jeanne’s work! Thanks for thinking of this Amber! I already like your fb page. When I think of Nantucket I think of home, so happy to call this lovely island home for the last 8 years! I’m loving the hand painted floral box on Jeanne’s etsy shop! What is a lightship basket? So hard to pick just one! I love the Mermaid Ornament on Jenna’s Etsy page! When I think of Nantucket the first thing that comes to mind is actually you and your blog! I found you on accident and had never been to Nantucket and didn’t know much about it (but I’ve learned a lot from your blog). 5) will soon be hitting the shop on Fair St! 3. I really like the hand painted whale frame. 1. When I think of Nantucket I think of mermaids and beaches. 2. I already love your page! 3. Mermaid doll ornament of course! The first thing I thing of is Brant Point lighthouse. visited and liked your fb page. visited Jeanne’s etsy shop. Love the picture frames. I will be giving one to a friend for Christmas. I purchased it in her store on Fair Street last Fall. Jeanne is a lovely person, I really enjoy shopping at her store.